microRNAs (miRNAs) are small, non-protein coding RNA molecules that function as negative regulators of gene expression either by inhibiting the translation of messenger RNAs (mRNAs) into protein or by degrading the mRNA. These molecules are relatively newly discovered, and much attention has been drawn towards these regulators the last years due to their role in various cellular processes, including cancer. Figure 1. 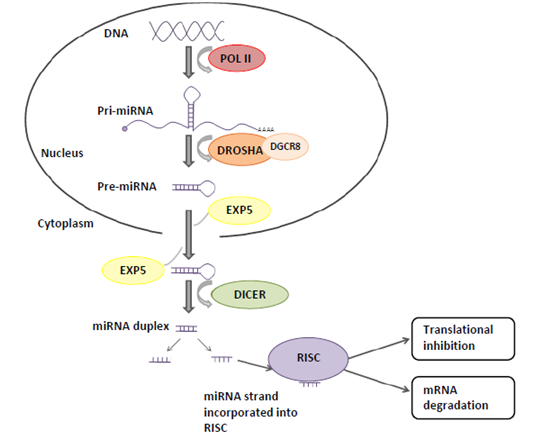 The canonical miRNA biogenesis pathway and miRNA function. Some miRNAs are involved in tumorigenesis by directly modifying tumor suppressor or oncogenic pathways. For example the overexpression of miRNAs can inhibit tumor suppressor pathways, causing tumor initiation and progression. Conversely, the loss of miRNA expression through loss-of-function mutations could result in enhanced expression of oncogenes, also leading to cancer. 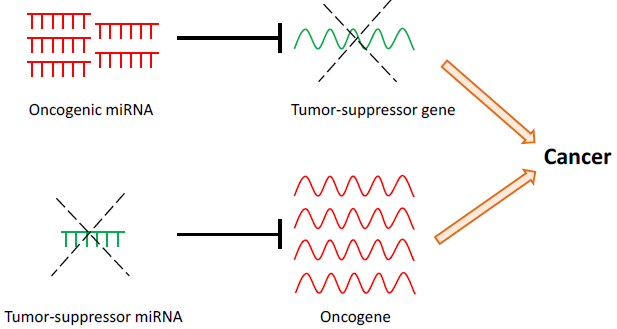 Figure 2. miRNAs may have oncogenic or tumor-suppressive roles in cancer. Upregulation of oncogenic miRNAs results in increased repression of tumor-suppressor target genes. Conversely, down-regulation of tumor-suppressor miRNAs results in decreased repression and thus increased expression of target oncogenes. Both scenarios may lead to cancer development and progression. We are studying the role of miRNAs in breast cancer by integration of various levels of genomic data available, e.g. copy number and methylation data from the DNA level, and miRNA expression and mRNA expression of predicted target genes on the RNA level. 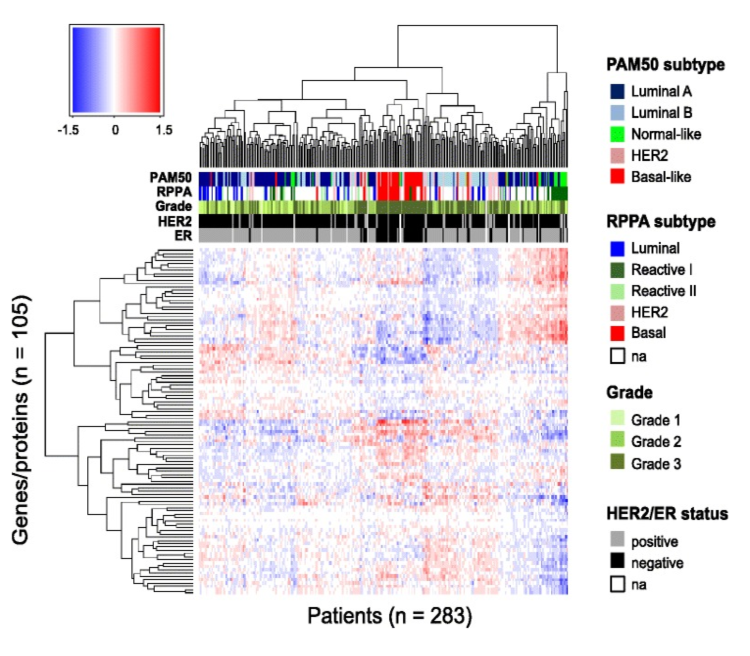 By this integration we are characterizing the aberrations of miRNAs seen across breast cancer patients, aiming at a deeper understanding on the mechanisms behind miRNA aberrations and the consequences of this in patient phenotype and outcome. Figure 3. 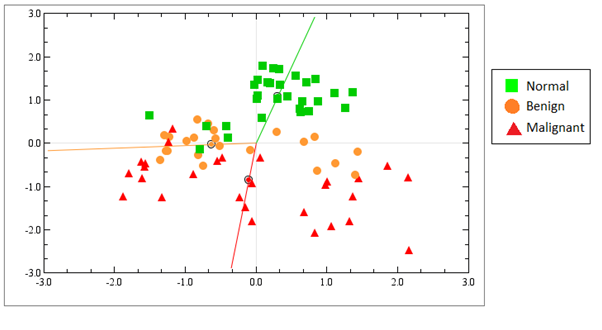 Integration and analysis of multi-dimensional data. 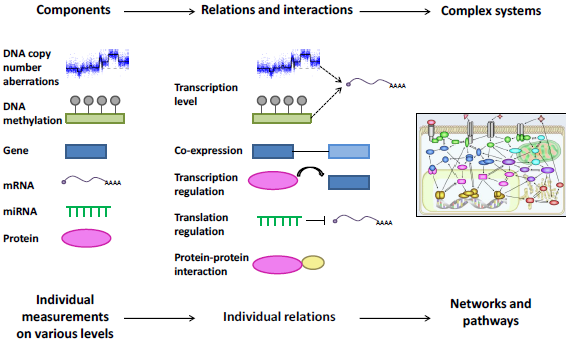 Biological components are measured across individuals and platforms, and their relations and interactions are identified. From this, complete networks and pathways are overlayed or built, and the emerging system is interrogated for alterations. Integrate miRNA and other data from various platforms (CGH, methylation, expression, SNPs) to generate a comprehensive understanding of the influence from miRNA deregulation in susceptibility, aggressiveness and treatment response of breast cancer. Identify miRNAs that allow us to group patients based on miRNA expression profiles, and compare this to histopathological findings, clinical parameters and other “-omics” dataset from the same samples to suggests new individual or combined biomarkers for use as tools to personalize the treatment of breast cancer. Much research has focused on miRNAs that are deregulated in cancer, and less research has been done with benign tumors, although benign tumors are much more frequent in women than malignant ones. We have therefore analyzed the miRNA expression profiles in benign, (fibroadenoma/fibroadenomatosis), malignant and normal breast tissue using miRNA microarrays. 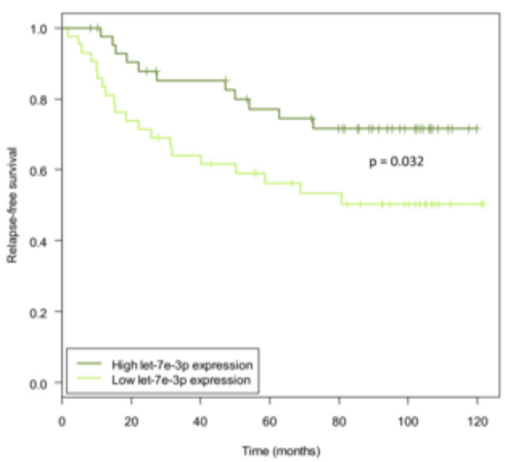 We found out that benign tumors are more similar to malignant tumors than to normal tissue when considering the miRNA expression profiles (Figure 4). Furthermore, we identified a set of 30 miRNAs that are considered as cancer-related miRNA, such as let-7 and miR-21, deregulated in the same way in benign tumors as in malignant tumors. In figure 6, the expression of only a few cancer-related miRNAs are shown. The miRNA expression in benign tumors is generally intermediate to normal and malignant tumors, indicating that miRNA expression is already deregulated at the early stages of tumor formation. 1. Miriam Aure 27.11.2013; Title of the thesis: From DNA to RNA to protein:Integrated analysis of high-throughput molecular data from primary breast carcinomas. 2. Andliena Tahiri 03.03.2016; Title of the thesis: Regulatory and functional genomic biomarkers in breast cancer and melanoma. 1.Integrated analysis reveals microRNA networks coordinately expressed with key proteins in breast cancer. 2. Deregulation of cancer-related miRNAs is a common event in both benign and malignant human breast tumors. 3.Individual and combined effects of DNA methylation and copy number alterations on miRNA expression in breast tumors.